Born in Harare, Zimbabwe, I came to New Zealand in 1994 (my wife is a Kiwi). It didn’t take me long to realize that NZ had some unbelievable diving. So we stayed!! 2 mortgages, 2 daughters and a couple of thousand hours underwater, the next 11 years I would take on full time roles as training manager for a number of dive stores in and around the Auckland area. It wasn’t until 2005 that I became self employed. Not going down the traditional route of opening up a dive shop (it seemed that all my experiences with people opening up dive shops showed that they got into the industry because they love their diving and once they opened up their shop more time was focused on the dive store and not the diving!!!). Not wanting to reduce the amount of diving I was doing, I set about trying to keep in the diving industry full time. This opened up a number of opportunities. The one thing that I did realize was that I had to be dynamic in order to maintain a revenue stream. What is your current involvement in diving? My current involvement in the diving industry is widespread. Being a self employed dive professional I have had to take on diverse roles to keep my revenue streams constant. One of my main focuses is keeping people actively diving, so I plan and lead dive trips locally in NZ and overseas. 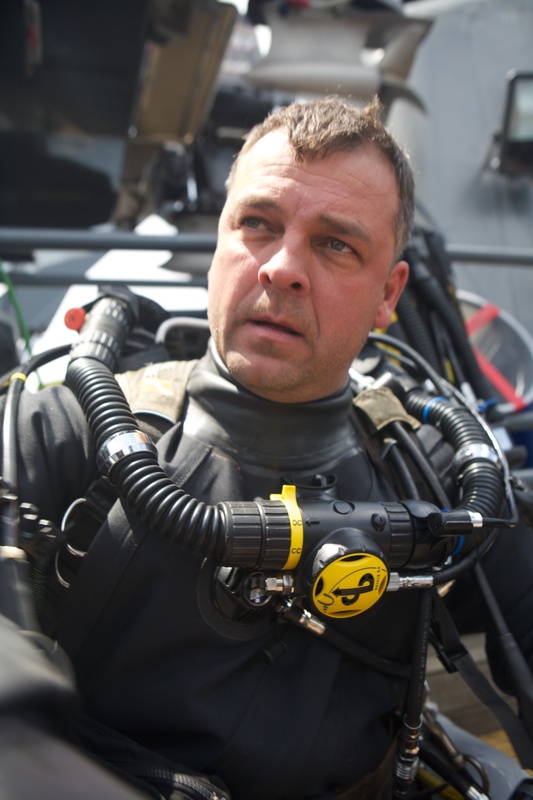 Training wise, I focus on specialist training in technical programs, advanced wreck penetration and all levels of rebreather (inspiration) courses up to advanced trimix. I also contract to a number of dive facilities countrywide offering all levels of recreational instructor training. I have 2 importing companies and have distributorships for 4 different lines of products (all diving related). I also work as a water safety supervisor for films and commercials when they arise. What are your highest certifications? How long have you been involved in tec? Having learnt to dive in England in 1990 this is where my “lust for rust” (wreck diving fetish!) was infused deep into my bones. From very early on in my diving career, we were undertaking limited decompression dives in the English Channel. This was the norm, diving to depths round the 30-40m range no one really wanted to get into technical diving but we had to in order to do the diving that was on our back doorstep. But with limited bottom times using single 15l cylinders with pony bottles, the urge to stay longer was always present. In 1993 I underwent formal technical diver training. I have always been interested in technology and when technology joins up with diving you get some interesting toys!! 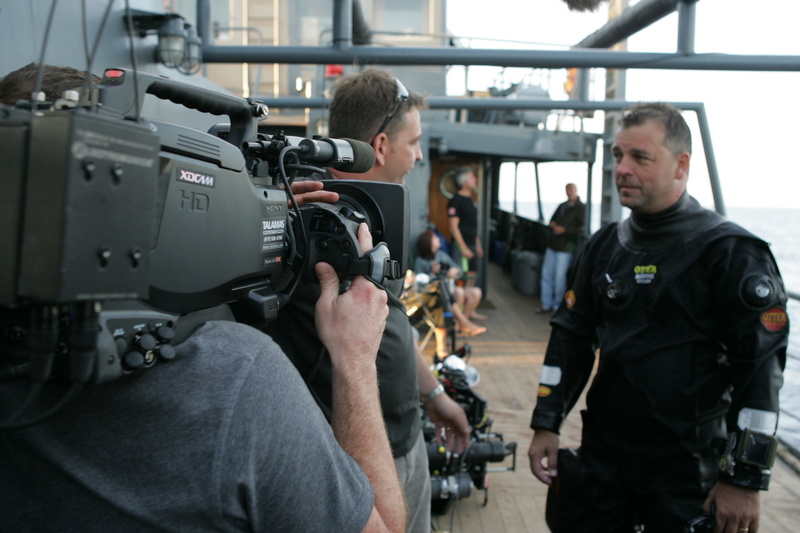 I had been watching very closely on the progress of rebreather technology and in 1995 I did my Drager Dolphin training. At this point I was the only person in NZ that had a rebreather. Later on progressing onto the Buddy Inspiration Closed Circuit Rebreather. Clocking up over 1500 hours on rebreathers they are a great tool to get me to places that I would not otherwise be able to explore. With exploration being at the very core of my diving interest I could now focus on wrecks that were inaccessible to most. I specialize in deep wreck exploration and photographing these historic sites for others to enjoy. I also organize and conduct specialized dive trips all over the world. What do you think are the greatest challenges are in this kind of diving? The biggest challenges in tech diving are finding a balance between training and building experience. 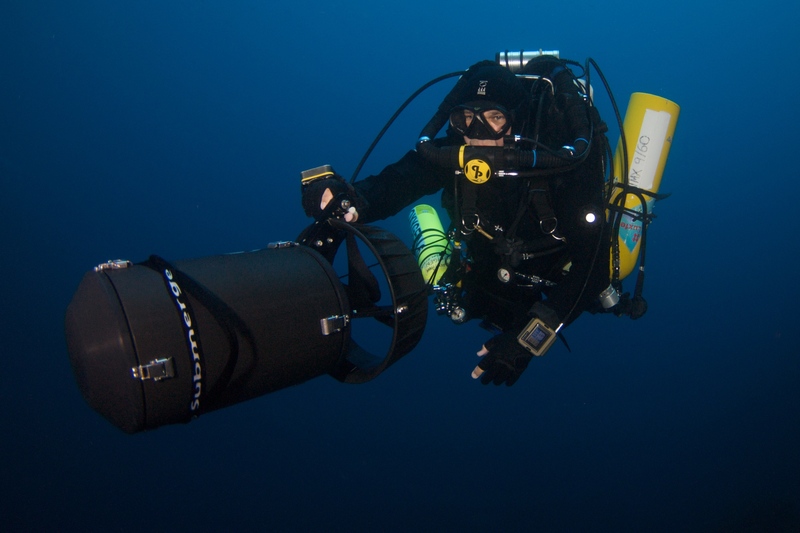 A manufacturer might rate a piece of gear to 100m but that doesn’t mean that we can go to that depth! We all need to learn how to use rapidly advancing technology to our advantage – not our demise. For an up and coming technical diver in this day and age one of the most challenging obstacles is being able to sieve through all the information that is so openly broadcast over the internet these days. Internet forums and newsgroups, can be the source of much needed information but unfortunately it is difficult for a new tech diver to know what is clearly fact or fiction! And regrettably a lot of information, which is so publicly posted, is clearly inaccurate. Being methodical, patient, able to know ones limits, taking things one step at a time, always willing to learn and not being complacent. Be a team player. What are the most likely mistakes a tech diver can make in your kind of diving? Being impatient, Progressing way more than ones abilities and experience. Complacency is a common mistake and failure to grasp the true nature of risk involved in a dive. How do you prepare for a tech dive? Like all extreme sports, the more you prepare, the more fun you can have during the event knowing that you have exhaustively covered all foreseeable circumstances and plans of action in the event of a problem. Areas covered is mental, physical, gear, team and logistical preparation. Over and above all the things listed above, which I consider to be ‘essential’ preparation skills and cannot be left out, is I like to prepare for a dive by thinking what I am going to be doing on that dive. The more research I do and information gathered about the site the better this makes me feel. There aren’t many dives I do without my camera (when I am not teaching) so taking pictures is what drives me to do these activities. So I make sure that I have a really good idea of what I want to get out of the dive – picture wise. Its just trial and error really, if a piece of gear will not do what I want it to do then I look for something that will. For example when it comes to exposure thermals for under my drysuit I heard all about how great the Fourth Element range was, so I bought a set. Then went out into 12 degree water, intentionally fully flooded my suit and stayed submerged for the next 2.5 hours. Warm and toasty!! It wasn’t until many years ago (last year) that my fourth element gear was used in anger. It was on a National Geographic Britannic expedition of which I was invited to be one of two stills photographers on the trip (Leigh Bishop was the other). A group of 10 of the worlds top rebreather divers gathered in Kea, Greece to embark on an expedition to uncover more mysteries of the Britannic, Sister ship to the Titanic. Lying in 118m of water I completed an hour of bottom time enjoying taking pictures of this historic wreck! It was shortly after my initial ascent that I needed to relieve myself. Equipped with a pee valve in my suit a malfunction occurred. Great!! With 7.5 hours of decompression to look forward to, I couldn’t hold it for that long. So I had to relieve myself in my suit – 5 times!!!! This may sound euwww but it is a potential life-threatening situation. My trusted thermal gear (of which I tested well before the event) got me safely through the decompression obligations and even though I am still addressed by my so called mates on the trip as “Swampie” my confidence in my kit was unparalleled. Doesn’t matter too much about brand names – as long as it works and you trust it. At the end of the day its only you that uses it!! A good recommendation is not to ‘test’ any gear on a major dive if your life depends on it!!! What type of person do you want diving in the same team as you? Someone you also enjoy to be around and to share the experiences that you encounter. This is what it’s all about, really. What advice would you give for someone thinking of getting into tech diving? Get good advice from people who you trust. First and foremost – Make sure you focus on what diving activities interests you. This is the very essence of where your focus should be. 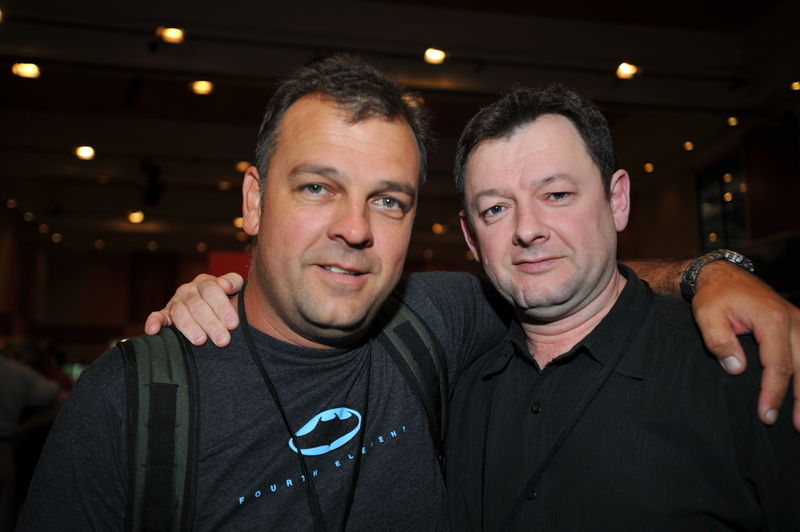 If its wreck diving, cave diving, reef diving, whatever it is, make sure that you get the best training from people that you look up to and respect. THEN surround yourself with likeminded people that are focused on doing these activities! Why would you want to get trained in an area if you don’t get out and do these activities???? There is a lot of mediocre tuition out there and very little exceptional trainers, so do your homework, make sure that the instructors you are looking at are not just “teaching” these activities – but actively DOING them. Your learning extends the entire length of your diving career not just a 5-7 day course. So make sure you surround yourself with people you can learn positive things from. Work out a strategy and set a plan as to how you are going to work a balance, between training and experience. Work out what your limits are. We need to step outside our comfort zone in order to grow our experience and to learn exactly how far to step without falling on our face. There is no substitute for proper planning. Think it through, be open minded, willing to always learn, stay open to ideas – from anyone!